I know. I know. I was going to post about Rhinebeck. However, I never got the photos from Christy, so I have no photos of Rhinebeck to post with. Sue me! I'll post some stories from Rhinebeck and leave others. Let's start with an update on my knitting. I finally finished one of Helen's Socks (ravelry). It looks awesome, and I say that with no humility. Why be humble when your work rocks? Check out this sock! I promise, Helen, I'll wash it before it gets to you! I already cast on for the second sock, but I have not knit very far into it. I'm still at the cuff. Also, thank you to people who gave me their opinion on the toes. I decided that I'd just knit until I ran out of yarn and then buy more yarn if needed. I know I'm going to end up buying a third skein of this yarn for what amounts to an inch of knitting in the round, so if anyone out there wants some sock yarn or would like anklets for small feet, let me know. 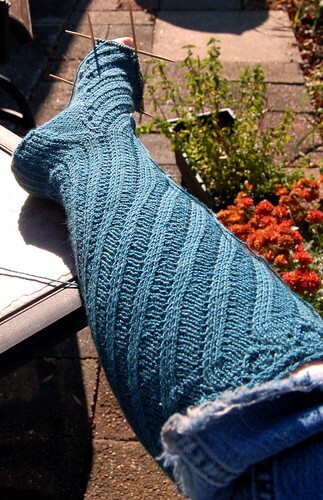 I know I can get a pair of size six and a half anklets out of a third skein, if I got one. I also have been knitting on my Slytherin scarf, as Paul and I have driven a fair bit recently and it is ideal for being a passenger, even if it is dark out, because it is all knit, knit, knit. I got past the first stripe sequence, after ripping out my screw up from the Rhinebeck drive. And that's it for knitting updates, folks! I didn't knit much. I prefer to spend time on the computer reading knitting blogs. I think on my next post when I run out of podcast reviews, I might do some blog reviews. As for podcasts... Well, I finally dumped DoubleKnit from my lineup. I just never got too excited about the show, and I didn't really care for their reviews of books and movies. When I last listened to the show, I literally thought, "Let me get this one out of the way and then enjoy some Manic Purl." After listening, I went to iTunes and removes my subscription. As for Knitter's Wading Pool, I skipped about six episodes and found the newer ones to be a little more palatable and a little more my own speed rather than being too basic. I'm going to stick out this podcast for another three or four episodes and then rethink my subscription. I'm currently listening to Knaked Knits, but I've yet to make any conclusions on the show other than I want to listen to several more. I'll update with my decision on it later. BTW, Helen, tell Bryan that the only two D&D podcasts I listen to and can recommend at this point are not live play podcasts. They are The Tome and Dungeon's and Dragons. The latter one did have several podcasts of Penny Arcade and PvP comic creators playing some D&D. For those of you interested in spinning, the latest episode of Manic Purl dealt with her new spinning wheel. The latest episode of Stash and Burn was of interest to all sock knitters, I'm sure. And, now... a quick Rhinebeck story. 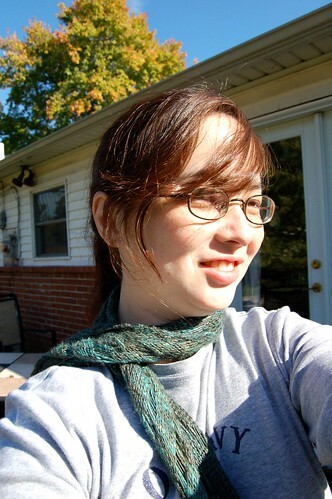 While wandering the fairgrounds, a lovely woman came up to Christy and asked her if she could photograph her Clapotis. She told us she was trying to photograph all the Clapotis(es?) she saw at Rhinebeck. Christy nodded, but quite nicely pointed out that I also had a Clapotis on. It's not very Clapotis looking as I made a skinny scarf version out of Golden Chai. See, would say that's very Clapotis looking, would you? Either way, the lady kindly asked me to get photographed as well after she asked me what yarn it was made out of. I nodded and got my photo taken, and she was talking about Ravelry a bit, when I noticed her Ravelry button had the name somebunnyslove on it. I immediately geeked out and told her I was in her ISO and destashing group! We got to chatting about the group and her blog, and I'm now sure she believes she has a stalker. Sorry if I scared you, if you should read this. I swear, I'm not a stalker, I just happen to love your group. It makes me want to buy yarn all the time. It was really awesome recognizing her and talking to her in real life. She showed me a skein of Wollemeise that I had almost attempted to buy from her since the colorway was named Paul and I saw her post one minute after she posted it, which is the only way to get Wollemeise. Unfortunately, I did not buy it, and it was signed by the Yarn Harlot at Rhinebeck. Bah! Lastly, for the other crafts, I took my "Learn to use your Sewing Machine" class this week. I learned how to do a blind hem, how to make a buttonhole, and how to sew on a button. I'm thinking of taking the beginner's class since they teach zipper installation and gathering. Today, I took the time to repair Paul's pajama pants and my own Banana Republic dress. Both were successfully fixed though my dress was more obviously skillfully fixed. Paul's pants look kind of wonky, but I figure they are only pajama pants and I want to make him some new ones anyway. That's all from me for today! Erk. Podcast Good. Casted Bad.